Is your network slowing down or acting up? Seven may be your lucky number. You don't have to be a network administrator or a network expert to troubleshoot common network issues. In many cases, a basic understanding of the OSI model and its seven layers is all you need to get a handle on these issues. Networks are prone to problems that can occur in any form, ranging from minor issues that can be easily resolved to complex issues that can be difficult and expensive to fix. 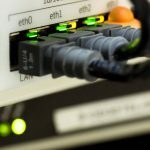 Although there is no one method or technique for network troubleshooting, it is always advisable to first understand and analyze the entire network in a systematic way. This can be done by gathering all the background information regarding the network and its functioning. OSI (Open System Interconnection) model is one of the basic concepts in networking. It enables a user to understand network architecture and how data is passed in a network. It is a standardized framework model for all the network-related schemes and their functioning. The OSI model consists of seven layers that help create a visual model of a network and its protocols. Physical layer is the first layer in OSI model. It deals with everything providing physical connectivity in a network, such as Ethernet cables, fiber cables, telephone cables, and wall jacks. The physical layer is responsible for sending bits from one computer to another. In this layer, data is transmitted in the form of bits and is represented as either 0 or 1. Other essential functionalities of this layer include managing transmission modes, synchronization, and line configuration. Hubs and repeaters are commonly used in this layer to physically transfer the information. Data-link layer is responsible for a reliable node-to-node delivery of data. This layer forms frames from data bits and plays a vital role in error detection and corrections. The data-link layer also synchronizes the information that has to be transmitted through data. Other functionalities of this layer are: framing of data, physical addressing, flow control, and access control. The data-link layer is divided into two sublayers: the Logical Link Control (LLC) layer and the Media Access Control (MAC) layer. The MAC layer provides the physical address for data transmission and the LLC layer provides flow control. Switches and network interface cards (NICs) are the commonly used networking components in this layer. Network layer defines the route to deliver data packets from source to destination across multiple networks. Terms such as routing and IP addressing are originated in this layer of the OSI model. The network layer supports both connectionless and connection-oriented services from all the higher-layer protocols. Major functionalities of this layer are to take care of addressing, assembling and disassembling data packets, error handling, and congestion control. Routers and gateways are the most commonly used networking devices in the network layer. Transport layer is responsible for reliable delivery of data from one end to another. It makes sure that a receiver receives the entire data intact. Transport layers have several protocols ensuring reliable data transfers. TCP and UDP are the two most widely used protocols. Firewalls are the commonly used networking devices in the transport layer. Session layer establishes, manages, and synchronizes all the interactions between communicating systems. It manages and synchronizes the entire conversation between two different applications in a network system. Even data transfer from one layer to another is synchronized in the session layer. Presentation layer makes sure that data reached at the receiver end is in an understandable and usable format. The presentation layer takes care of the structure, syntax, and semantics of the information exchanged between two communicating systems in a network. Translation of data being exchanged in a network, encryption, and impression are other important functionalities of this layer. 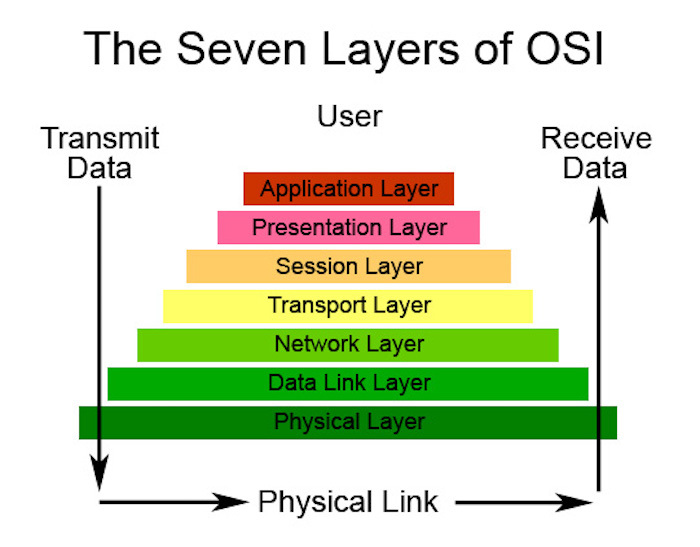 Application layer is at the top of the OSI model pyramid. It allows a user to manipulate data in multiple ways to get access to the network. Email, file-transfer protocols, network resources, and root directory services are a few services provided by this layer. Now that we know the descriptions and functionalities of all the layers in an OSI model, we can split the network issues among these seven layers and can systematically troubleshoot a network. In any network, most of the problems occur at the physical, data-link, and network layers. Therefore, it is always advisable to start troubleshooting from the physical layer and gradually proceed to the application layer. The first step a user has to take in troubleshooting a network in the physical layer is to check whether all the physical components involved in the network are plugged in and working properly. 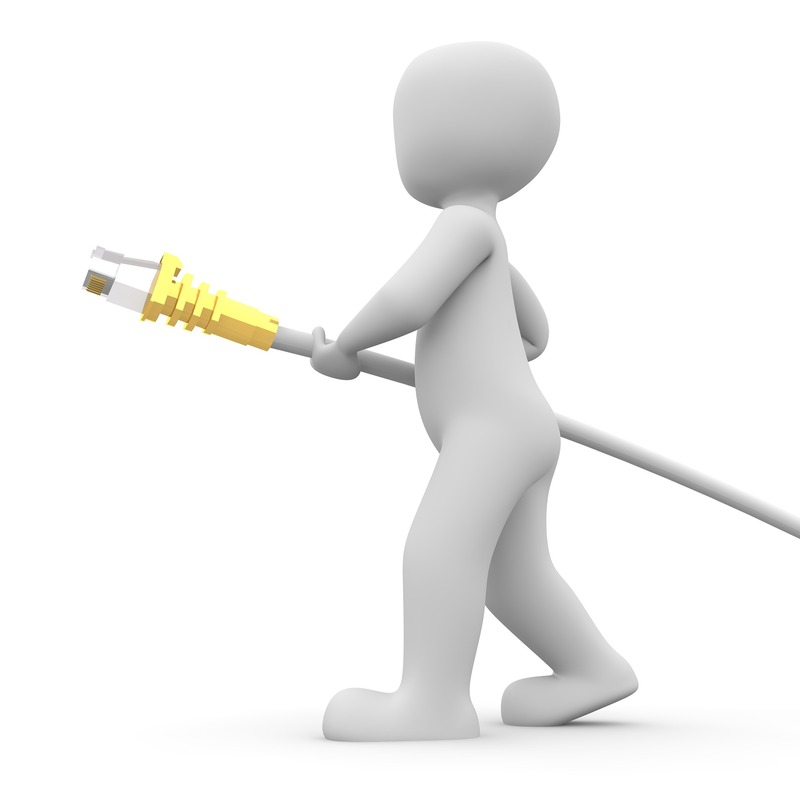 Most of the network issues occur because of damaged cabling or terminations. In the case of a wireless network, excessive signal attenuation and wireless interference are a few common issues to watch out for. If all these aspects are verified and the problem still persists, you’ll have to head up to the data-link layer. At the data-link layer, verify all the switch and VLAN configurations along with the MAC addressing. If the problem still continues, look for IP address conflicts and try to eliminate any duplicate IP addresses. As a final step, check the spanning tree protocol (STP), as it plays a vital role in managing network loops, which often jam or flood the network. Moving up to the network layer, you’ll find that network addressing issues and routing issues are the most common problems that occur here. By verifying all the routing protocols and IP addressing schemes used, tracking down the network issue can be very easy. A few possible causes for network issues are damaged networking devices, incorrect device configurations, network bandwidth, and authentication issues. “Ping” is a very handy and effective troubleshooting command to locate network issues in this layer. A successful ping past the default gateway means that the Internet is working properly. “Trace,” “netstat,” “route,” and “netguard” commands are a few other troubleshooting commands that can be used in the network layer. Most issues at the transport level revolve around ports that are blocked or damaged. Make sure that there are no firewalls blocking the TCP/UDP ports. Finally, disabling quality of service (QoS) can sometimes resolve a few network-related issues. There are hardly any issues that occur at the session and presentation layers because both just perform the functionalities that complement or enhance the functioning of a network. These layers play a comparatively less active role in the functioning of a network compared with the other OSI model layers. The application layer is where all the client-server and service-related applications, such as SMTP, HTTP, POP3, FTP, are used. It is also the layer where you will often find DNS-related issues. Most of the network issues related to DNS functionality can be fixed using the “nslookup” command. Another effective and useful command in troubleshooting a network at the application layer is “tcpdump,” which is used for filtering TCP/IP packets and analyzing network packages. As you’re troubleshooting, make sure to take notes. Documenting the problem and the steps you take to resolve it will be very useful for future reference. And even after everything appears to be working again, you are not quite finished. Try to re-create the problem to understand the reasons why it occurred and make sure that it really was the root cause of your network issues. This way you can verify that the problem has been resolved, and you won't find yourself suddenly back at step 1 a few days later. Good article for newbies!! Great job. This still doesn't explain how to use the OSI model to troubleshoot. I know the model, but I find it useless for troubleshooting. I don't need to know the layers to know to start pinging, or check the cable, or the NIC, switch. So far to date NOBODY can give me a compelling argument why knowing the OSI model helps with troubleshooting, because in my 20 years experience......it doesn't. Nice to know information, but is useless to me in troubleshooting. Troubleshooting network issues actually is not done by the OSI model. But, the OSI model provides you the fundamental information, based on which we can respond to the issue and troubleshoot.